The Love Bandit is on his way to steal as many hearts as he can find. 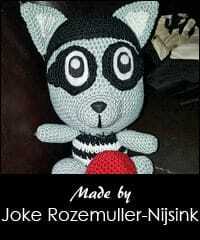 The amigurumi will be about 13 cm tall. To make a perfect Valentine’s Day gift, you can also fill the bag with candy hearts. Amazing!!! This is the cutest bandit evee! What a cute gift to make for Valentine’s! Omg he is so so adorable!!! This is so adorable. Your attention to detail is stunning. Aww! I want to win!! He’s perfect!! Love this bandit and have shared on my pinterest! I love him and his name is the best!! What an adorable little guy!!! He’s definitely stolen my heart! !